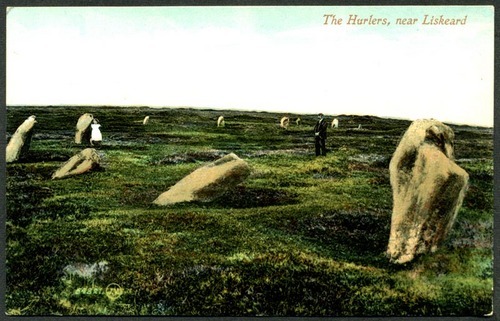 A postcard of the Hurlers taken from a photograph by Valentine & Sons. 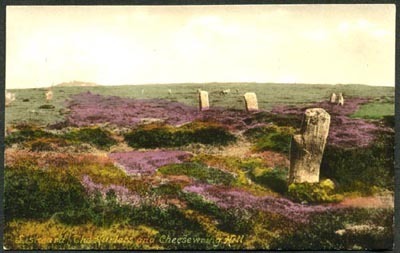 The Hurlers are a rough alignment of three stone circles on the southern extremity of Bodmin Moor, and the circles here are noticably larger than those in the west of the county. 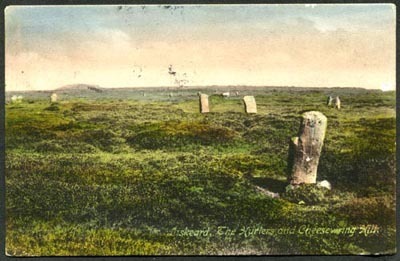 In 1728 a local man named William Harvy1 had described the stones as: "The Hurlers, being about 22. great stones, standing upright on one end, in a plain piece of ground: so called, as the tradition goes, from so many men being at a hurling on a Sunday; and so, for their sin of sabbath breaking, by God Allmighty turned into these stones, as a monument of disobedience, & sin, like that of Lot's wife. But the truth of the story is, it was the burying place of the Brittons, before the coming of the heathen Saxons into this Kingdom: and this fable, invented by the Brittons, was to prevent the ripping up of the bones of their ancestors; and so called by the name of The Hurlers to this day." Stockdale, writing almost one hundred years later,2 notes that "The Hurlers, when perfect, consisted of three circles of upright stones from three to five feet high; but several of them have been removed. According to historians, these monuments of antiquity are said to have been of Druidical origin: but the name of hurlers is most probably derived from an opinion among the common people, that the stones were once men, who were transformed for Hurling (a favourite game among the antient Cornish people) on the sabbath day." A pair of postcards by Frith & Co taken from the same photograph but showing the wide variations in colouring used for these false colour postcards. The excavation notes in the Proceedings of the Prehistoric Society for 19353 mention that the re-erection of the stones of the central circle under the direction of Mr Ralegh Radford was well underway and that it "consisted of 28 stones, of which 13 remain intact, socket-holes only surviving of the others. On the side nearest the southern circle there was a double space, a larger pit, containing rude paving, occupying the position where the socket of a stone upright might have been expected. The discovery in the interior of the circle of a floor of crystals from the granite rock, too thick to be explained on natural grounds, suggests that the standing stones were hammer-dressed and the refuse spread over the interior of the circle. The stones were hammer-dressed above ground and stood in large pits packed round with blocks of granite. Care was evidently taken to see that the tops of the stones rose to the same level above the ground. Near the centre a prostrate stone was discovered; it is uncertain whether it stood upright or not." 1. A Large And New Description of The Parish of Linkinhorne, in The County of Cornwall, with All it’s Bounds, Limits, Rivers, Brooks, Highways, Villages, Situation, Nature, Value, Fertility, Rates, Rents &c - By William Harvy, July, 1728. British Library, add. 33420. 2. Stockdale, F W L. 1824. Excursions in the County of Cornwall, comprising a concise historical and topographical delineation of the Principal Towns and Villages, together with descriptions of the Residences of the Nobility and Gentry, remains of Antiquity, and every other interesting object of curiosity. Simpkin and Marshall (Facsimile, D Bradford Barton, 1972). 3. Clarke, J G D. 1935. 'Notes on Excavations in England, the Irish Free State, Northern Ireland, Scotland and Wales, during 1935 - England, Bronze Age: The Hurlers, near Liskeard, Cornwall'. Proceedings of the Prehistoric Society 1, p134.